From her experience and knowledge of process oriented psychology and creativity, author, therapist, and artist Amy Mindell takes you on a journey to discover the hidden creativity and inspiration in your body, in material objects, in the environment, and even in your day-to-day work. Her book THE DREAMING SOURCE OF CREATIVITY, shows how dreaming and imagination are essential aspects of a fulfilling life. Filled with stories, easy to follow exercises, and over 100 pictures, THE DREAMING SOURCE OF CREATIVITY offers simple and easy ways to creatively enjoy and work on yourself by sensing the “intentional field”, the dreaming source of creativity that is always present within and around you. You discover how creativity arises from almost nothing and is hidden even in the most mundane parts of life. You will tap your deepest nature using art, music, puppets, movement, relationships and other amazing worlds. The creative methods in this book are also helpful for those therapists who would like to bring a creative and artistic dimension to their work. Process oriented psychology offers a unique, mind-expanding approach to creativity based upon dreams, body experiences, and overall life situations. Using the “intentional field” as the source of creativity is a new and unique perspective in art therapy, acting, and dance. Lao Tse Press, Portland Oregon. www.laotse.com. “COMA” guides family and health care professionals in contacting people in deeply altered or comatose states of consciousness. Coma work attempts to raise the awareness or even awaken people in these states—regardless of the origin of these states—by assuming their experiences are potentially significant and meaningful. Independent Publisher January,1999 Mindell’s revolutionary guide paves the way for an exciting journey through the depths of human experience. It renders a diagnosis of coma anything but a dead-end road. 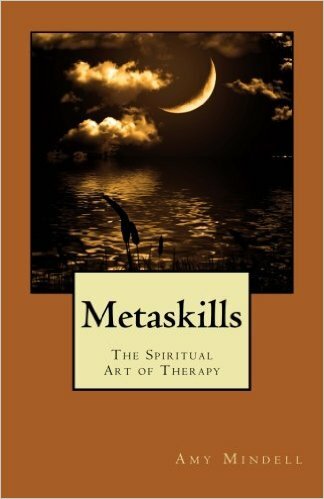 Metaskills, the feeling attitudes behind personal therapeutic talents, are the alpha and omega of healing. Amy breaks new ground in a theory and practice of the most ancient of all arts. http://www.laotse.com. In this art magazine, Amy's colorful and expressive flower-art figures reveal how nature’s creativity can inspire your own creativity. Each of her pictures uses only flowers and other plants. After looking at this magazine, she hopes you too will be inspired to dream and create with nature!